Description: This tutorial secures access to a FIWARE application using the entities created in the previous tutorial. The tutorial explains appropriate use of the various OAuth2 grant flows, and how to use the Keyrock generic enabler as an Authorization Server to identify users. Keyrock is also used as a Policy Decision Point (PDP) to restrict access. The tutorial discusses code showing how to integrate Keyrock within a web application and demonstrates examples of Authorization Server interactions using the Keyrock GUI. Some cUrl commands are also used to access the Keyrock REST API - Postman documentation is also available. In order to secure access to application resources, it is necessary to know two things. Firstly, who is making the request and secondly is the requestor permitted to access the resource? The FIWARE Keyrock generic enabler uses OAuth2 to enable third-party applications to obtain limited access to services. OAuth2 is the open standard for access delegation to grant access rights. It allows notifying a resource provider (e.g. the Knowage Generic Enabler) that the resource owner (e.g. you) grants permission to a third-party (e.g. a Knowage Application) access to their information (e.g. the list of entities). The primary concept is that both Users and Applications must first identify themselves using a standard OAuth2 Challenge-Response mechanism. Thereafter a user is assigned a token which they append to every subsequent request. This token identifies the user, the application and the rights the user is able to exercise. Keyrock can then be used with other enablers can be used to limit and lock-down access. 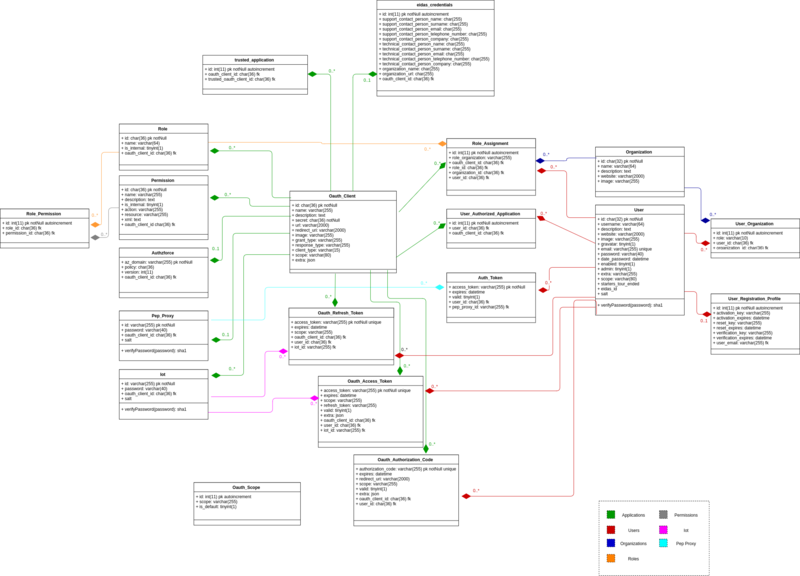 The details of the access flows are discussed below and in subsequent tutorials. The reasoning behind OAuth2 is that you never need to expose your own username and password to a third party to give them full access - you merely permit the relevant access which can be either Read-Only or Read-Write and such access can be defined down to a granular level. Furthermore there is provision for revoking access at any time, leaving the resource owner in control of who can access what. Once the application is able to authenticate users, it is also possible to lock down access using access control mechanisms. Access control requires having an access policy - in other words defining who can do what. 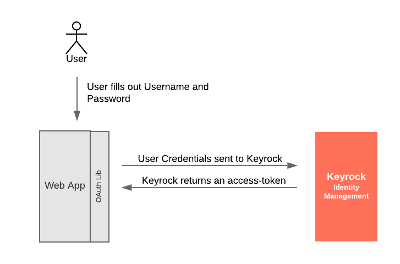 We have already defined roles and permisions within the previous tutorial, and now need to programatically enforce this policy by adding in a simple Policy Decision Point (PDP) – which evaluates and issues authorization decisions, and then secure access by enforcing the decision using a Policy Enforcement Point (PEP). 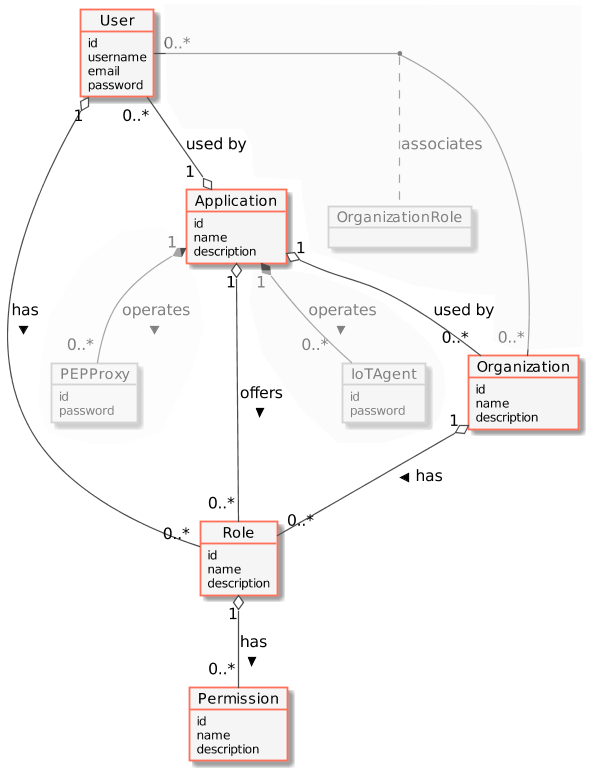 PEPProxy - a middleware for use between generic enablers challenging the rights of a user. This application adds OAuth2-driven security into the existing Stock Management and Sensors-based application created in previous tutorials by using the data created in the first security tutorial and reading it programatically. 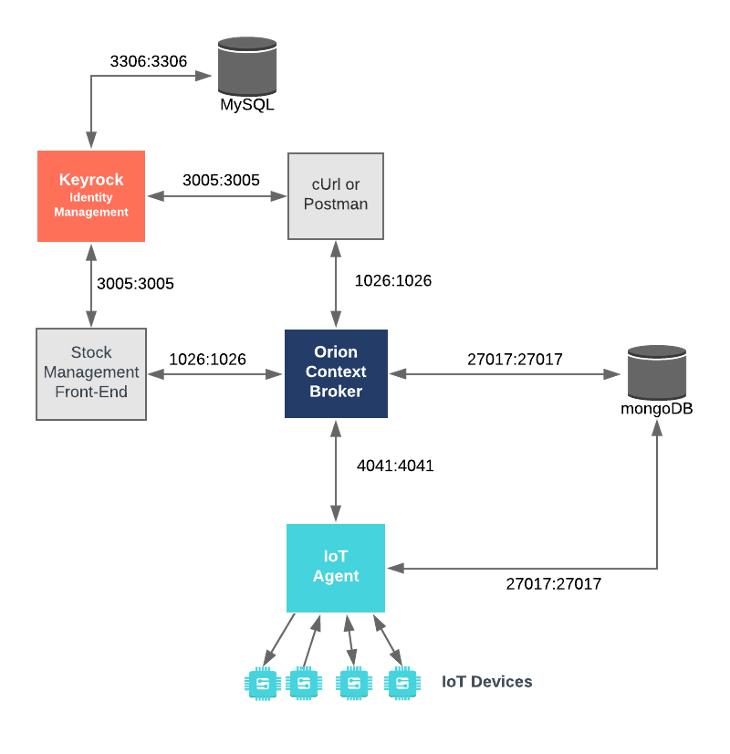 It will make use of three FIWARE components - the Orion Context Broker,the IoT Agent for UltraLight 2.0 and integrates the use of the Keyrock Generic enabler. Usage of the Orion Context Broker is sufficient for an application to qualify as “Powered by FIWARE”. Both the Orion Context Broker and the IoT Agent rely on open source MongoDB technology to keep persistence of the information they hold. We will also be using the dummy IoT devices created in the previous tutorial. Keyrock uses its own MySQL database. Allows users to "buy" products and reduce the stock count. A webserver acting as set of dummy IoT devices using the UltraLight 2.0 protocol running over HTTP - access to certain resources is restricted. Port 3000 is exposed so we can see the web page displaying the Dummy IoT devices. Port 3001 is exposed purely for tutorial access - so that cUrl or Postman can make UltraLight commands without being part of the same network. WEB_APP_PORT 3000 Port used by web-app which displays the login screen & etc. KEYROCK_PORT 3005 This is the port that Keyrock is listening on. CALLBACK_URL http://localhost:3000/login The callback URL used by Keyrock when a challenge has succeeded. The separate KEYROCK_URL and KEYROCK_IP_ADDRESS are only necessary because of the simplified Docker containerization used within the tutorial. The KEYROCK_URL variable with the value localhost is referring to the location externally exposed by the container, the KEYROCK_IP_ADDRESS variable refers to the same location but accessed from within the Docker network. Similarly the CALLBACK_URL contains localhost as it is assumed that the browser will be accessed from the same machine. All of these values should be replaced with appropriate proxies and DNS settings for a production environment, but production deployment is beyond the scope of this tutorial. Where <command> will vary depending upon the exercise we wish to activate. To save time, the data creating users and organizations from the previous tutorial has been downloaded and is automatically persisted to the MySQL database on start-up so the assigned UUIDs do not change and the data does not need to be entered again. 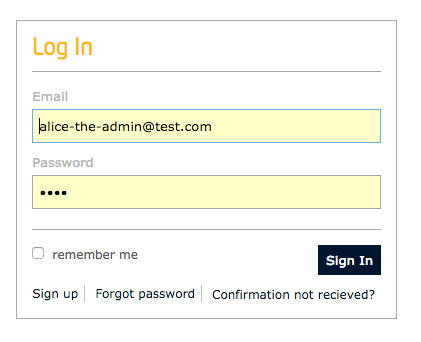 To refresh your memory about how to create users and organizations and applications, you can log in at http://localhost:3005/idm using the account alice-the-admin@test.com with a password of test. As noted in the documentation, FIWARE Keyrock complies with the OAuth2 standard described in RFC 6749 and supports all four standard grant types defined there. All four major grant flows can be demonstrated within the tutorial application, the actual flow to pick will depend on your own use case. 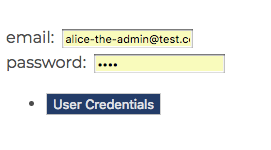 It is possible to invoke the User Credentials grant flow programmatically, by bringing up the page http://localhost:3000/ and filling out the username and password form. The Authorization Code grant flow can be used where the client (in our case the Tutorial Web-application) doesn't need access to any passwords directly - it just needs to know who the user is. With the Authorization Code grant, the user is redirected to an Authorization Server such as Keyrock, logs in there and permits access. The response returns an access-code which can be exchanged for an access-token which then identifies the user. This is an example of the sort of flow used when a third party (such as Travis-CI) asks you to log in using your GitHub account. Travis never gains access to your password, but does receive details that you are who you claim to be from GitHub. The after the User authorizes access, the response is received by the redirect_uri and is handled in the code below, a interim access code is received from Keyrock and second request must be made to obtain a usable access_token. The response displays the user on the top right of the screen, details of the token are also flashed onto the screen. Note Unless you deliberately log out of Keyrock > http://localhost:3005, the existing Keyrock session which has already permitted access will be used for subsequent authorization requests, so the Keyrock login screen will not be shown again. Note Unless you deliberately log out of Keyrock > http://localhost:3005, the existing Keyrock session which has already permitted access will be used for subsequent authorization request. The final grant flow - the Client Credentials grant, does not need a user. It is sometimes necessary for an application to identify itself so that the application (rather than the user) is granted access to resources. There are no resources secured in such a manner within this tutorial, but the flow has been included for completeness. The response returns an access code to identify the application itself. The code is similar to the User Credential Grant, but without an explicit username or password. The response displays the details of the token. No User is involved. Once a User has identified themselves (using any appropriate grant type), they should not need to log-in again, even though the access_token they are using is time-limited. To provide continued access, an addition Refresh Token flow has been defined, allowing a User to exchange an expired token for a new one. Offering this exchange is not mandatory for OAuth2 Authorization Servers, and is not appropriate for all grant types. The response is similar to the previous response, but the access_token and refresh_token have been updated and the expiry window has been moved forward. The code delegates all the OAuth2 calls to a separate library oauth2.js. Every request includes the standard OAuth2 header and each request is wrapped in a promise to simplify the application code. The Request Token flow is invoked using the oa.getOAuthRefreshToken() function - the previously received refresh_token used to receive a new access_token once the previous token has expired. It is possible to invoke the Token Refresh flow programmatically, by bringing up the page http://localhost:3000/ and filling out the username and password form. Pressing the Refresh Token button invokes returns a new access_token and refresh_token for the logged in user. Level 1: Authentication Access - Allow all actions to every signed in user and no actions to an anonymous user. Level 1 PDP can be used in conjunction with any OAuth2 provider using any flow. If a user has authenticated using Keyrock, the freshness of the access token can be checked by making a GET request to the /user endpoint. A successful response indicates a valid access_token. Level 2 PDP can only be used with our own trusted instance of Keyrock, usually via the Password Grant flow. If we are using our own trusted instance of Keyrock, once a user has signed in and obtained an access_token, the access_token can be stored in session and used to retrieve user details on demand. The request for user details may be extended to include resource permissions. Using this information it is possible to permit or deny access to individual resources. The response include an authorization_decision attribute which permits or denies access. Ensure that you are not signed in as any user. Eve has an account, but no roles in the application. Note As Eve has a recognized account, she gains full authentication access, even though her account has no roles attached.